Preheat a well-oiled, cast iron skillet in a 375 degree oven. In a small bowl, mix starch, chia, cinnamon and juice. Let stand 5 minutes. Make crumb topping by mixing oats, flour, flax, and cinnamon. Add in oil, butter, and syrup and mix with a fork or fingers until crumb-like. Pour starch mixture over sliced peaches and gently stir. Remove skillet from oven and place peaches into hot skillet. 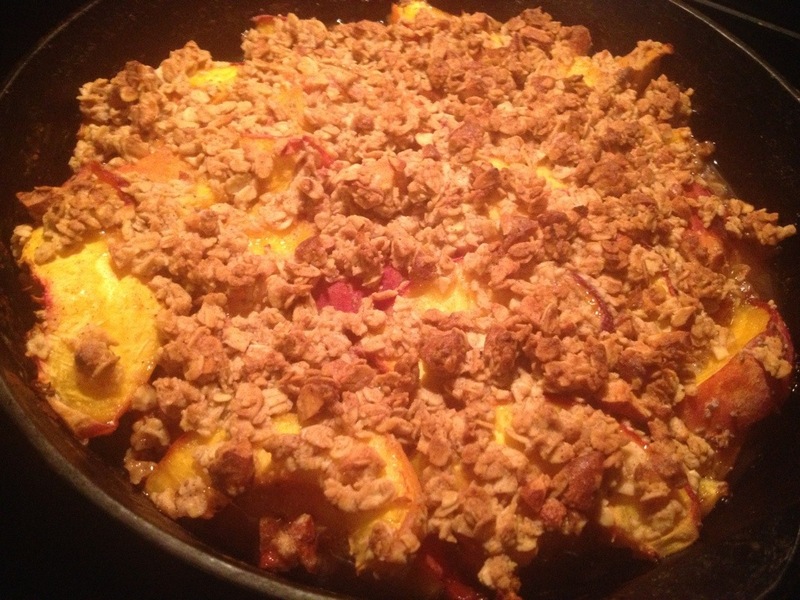 Drop crumb mixture evenly over peaches. Bake at 375 for 20-25 minutes until bubbly around edges. Remove and allow to rest at least 5 minutes until juices set up firmly. If desired, serve with a dollop of greek yogurt, flavored with honey and cinnamon.